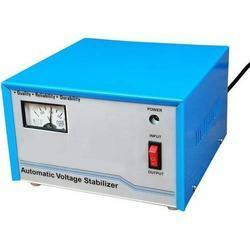 Prominent & Leading Manufacturer and Supplier from Coimbatore, we offer Voltage Control Stabilizers such as Voltage Stabilizers, Automatic Voltage Stabilizers, Servo Voltage Stabilizers, Controlled Voltage Stabilizers, Three Phase Voltage Stabilizer, Automatic Voltage Stabilizer and many more items. We are a unique entity in the market, actively committed towards offering an optimum quality range of Servo Voltage Stabilizers. 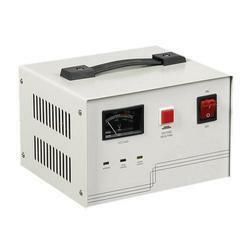 These voltage stabilizers designed comprising auto reset system and single phasing prevention. 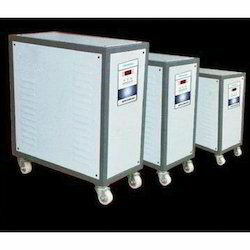 Our provided voltage stabilizers are tested against various quality parameters so as to ensure their quality. Besides this, offer offered voltage stabilizers are used in many industries for controlling the voltage related problems. 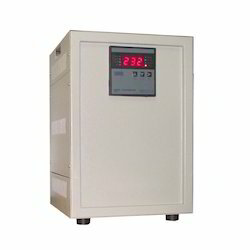 We offer our prestigious clients the premium range of Voltage Stabilizers that control fluctuations in the input voltage and offer constant output voltage with /- 1% accuracy and save power. Our voltage stabilizers are used for protecting from voltage fluctuation, which causes malfunction or break down in equipment. The offered voltage stabilizers are manufactured using quality proven components and advanced technology in line with the quality norms. Backed by rich industry experience, we are highly engaged in offering the best quality range of Controlled Voltage Stabilizers. The offered stabilizers are demanded for its low maintenance, sturdy construction and easy to use operation mechanism. Offered stabilizers are used for precise control of output voltage that significantly increases the life of appliances and machine. Customers can purchase these stabilizers from us in quality packing at industry leading rates within a promised time frame. 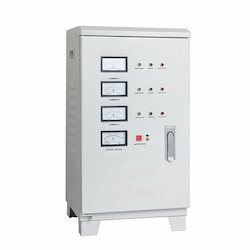 We are involved in offering an entire range of Automatic Voltage Stabilizers, which is mainly designed to provide a consistent power supply with accuracy of /-9%. Voltage Power Controllers are built with the latest technology to give you peace of mind with un compromised protection for your electronic equipment. Our stabilizers always meet international quality standards and offer better efficiency and reliability. 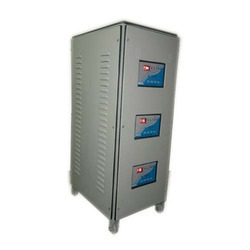 Three Phase Voltage Stabilizer consists of very simple electronic control circuit for monitoring and controlling voltage, repair & maintenance of which is very easy. Generally Voltage is low during day time and high during night hours. Moreover on holidays, peak hours, rainy days and when agricultural and Industrial load is switched off, the voltage rises sharply which is more dangerous. Keeping in mind the ever-evolving requirements of our prestigious clients, we are offering an exclusive range of Voltage Stabilizers. These stabilizers are developed for meeting the needs of consistent power supply in residential and commercial sectors. We are giving these stabilizers on several customized options & specifications to choose from. Our stabilizers are stringently checked on industry defined quality parameters in order to assure its flawlessness. With enriched industrial experience and knowledge, we are providing a wide range of Three Phase Air Cooled Servo Stabilizers. 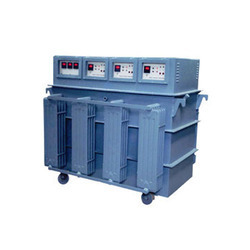 These stabilizers are used for reducing the breakdown of electrical equipment from uneven voltage fluctuation. Our provided stabilizers are tested against various quality parameters so as to ensure their quality. Besides this, offer offered stabilizers are available in varied specifications to our customers according to their requirements.